Inverclyde Volunteer of the Year 2018 Nomination. Congratulation to Kathleen Greenock Cut Conservation Chair and good luck in the award. Many of our regular visitors and event attendees will be familiar with our former staff member Kathleen McMillan. 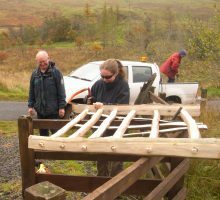 She started in the Park as a volunteer before successfully earning a Seasonal Ranger post with the National Trust for Scotland; she then did a season as a Seasonal Ranger with us before taking up a post as a Ranger at Whitelees Wind Farm. She continues to volunteer for the Park as the chair of the Greenock Cut Conservation Volunteer Group as well as volunteering locally with the Clyde Bat Group and as a Marine Conservation Sea Champion amongst other things! We are delighted to see her nomination for the RSPB Nature of Scotland Award – category ‘RSPB Young Nature Champion’ and wish her the best of luck.